Leading off this week, a long and fascinating read: Why would someone steal the world’s rarest water lily? From The Edwin Garcia Links Machine, and these images are amazing: Vintage Photos of Veterans of the Napoleonic Wars, Taken Circa 1858. Next, and I think Eli 13.3 needs to watch this series, it's Remembering Blackadder Goes Forth: How a TV comedy made the most powerful point about the First World War. This is quite a stunning use of space: Tiny apartment in Paris (8sqm only). This is an absolutely tremendous story: What The Most Infamous NBA Heckler Learned From His Friend Muhammad Ali. And here's one more: The Secrets Behind Harry Houdini’s Ten Greatest Illusions. And a third: VANGUARD AFTER THE REVOLUTION: Bill James sparked a baseball insurrection, but he has regrets about the world he wrought. I guess it's a four-pack this week, because I just read this: The Empire of Edge: How a doctor, a trader, and the billionaire Steven A. Cohen got entangled in a vast financial scandal. From Aaron Ward, and this looks fantastic: The Internet Arcade puts 900 classic games right in your web browser. 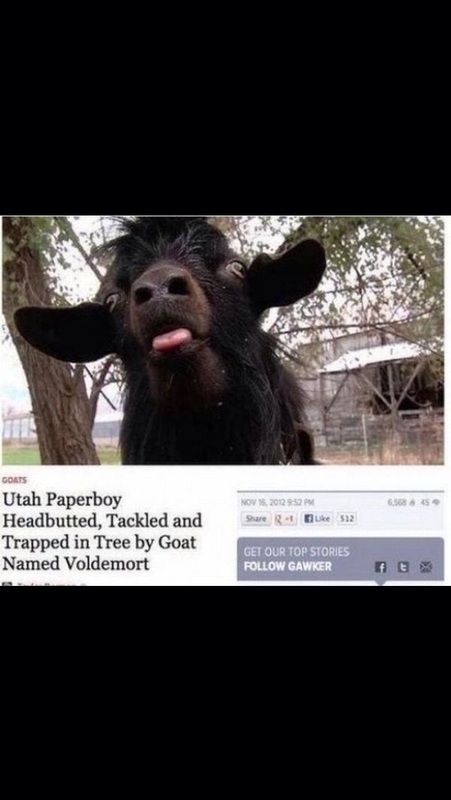 From Brian Witte, and this is quite a headline: Utah Paperboy Headbutted, Tackled and Trapped in Tree by Goat Named Voldemort. What I find even more interesting is that "goats" appears to be a news category. From Nate Carpenter, and this was an immediate purchase: Fantastically Wrong: The Inventor of the Airliner Also Invented This Hilariously Absurd ‘Science’. From Frank Regan, your badass of the week: Lions vs Porcupine.